The Lenovo Yoga Tablet 2 Pro is out of the ordinary. 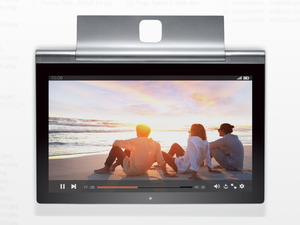 It’s not much bigger than most Android tablets at 13 inches, but it has a pico projector embedded in its hinge. That’s in addition to its neat kickstand that you can orient any way you like. At $500, The Yoga Tablet 2 Pro is much more affordable than buying both a tablet and a projector individually, but that’s little consolation if you have to deal with Lenovo’s horrid adjustments to the Android interface. This enormous, productivity-centric tablet has so many things going for it, but its shoddy Android customizations ultimately hold it back. It is a tablet or a laptop? Ignore its gargantuan size and the Lenovo Yoga Tablet 2 Pro is quite the stylin’ tablet. It features a sleek aluminum finish around the edges and on its backside, giving it a nice business-like aesthetic. Its rear-facing kickstand is also made of aluminum, and thankfully, it isn’t as difficult to orient as previous Yoga Tablet models. It also pops out more easily with just the push of a button, so you don’t have to worry about chipping a nail when prying it loose. The Lenovo Yoga Tablet 2 Pro is one sleek piece of hardware. I never thought of using an Android tablet as a work machine, but it’s quite possible with this device. Its 13.3-inch Quad HD IPS display is not only ideal for catching up on your Hulu queue, but it’s great for multitasking, too. I paired the tablet with a Logitech Bluetooth keyboard and got a ton of work done using productivity apps like Google Docs and Microsoft OneNote. It felt almost exactly like using a regular laptop for work, except that I was touching the screen to move around the interface instead of a wielding a mouse. 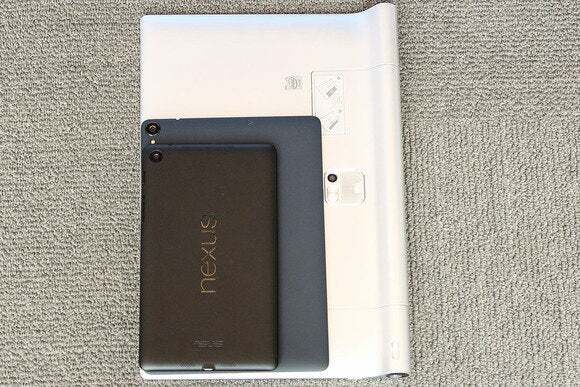 A second-gen Nexus 7 stacked on top of a Nexus 9 stacked on top of a Lenovo Yoga Tablet 2 Pro. Of course, its size will eventually become an issue. Not only is it wider than my 13-inch MacBook Air, but it didn’t fit in the messenger bags and large purses that typically fit my laptop. To add insult to injury, I had to take it out to get through the security line at the airport, and I was asked to put it away as the plane was getting ready to land. I didn’t bother to explain that it was actually an Android tablet, however, because I didn’t think anyone would believe me—and anyway, it’s already bigger than my usual work machine. The Lenovo Yoga Tablet 2 Pro takes up most of the tray table on a jam packed plane. Actually using it on the plane was a bit of a drag. Apps that don’t support landscape mode required that I flip the tablet vertically, which made it awkward to hold in a narrow airplane seat. I did appreciate the larger display size for things like reading digital magazines, but the added weight of the hinge/projector bulge on the tablet’s backside made it difficult to comfortably hold the device with one hand, or lay it down on my lap. I encountered this same conundrum on my usual commute to work. Still, once you get the hang of it, its size doesn’t seem too bad. That is, if you don’t already have a laptop you carry with you every day. This tablet has a projector built into its hinge. The pico projector built into the Yoga Tablet 2 Pro is capable of displaying a 50-inch wide, 854 x 580 image on almost any wall. It springs to life with the touch of a button on the side of the device, and you adjust focus with a slider on the back. The display will then turn off after a predetermined amount of time to help conserve battery power. Hold on, I’m saying goodbye to Colbert. I’m not a typical projector user, but the Yoga Tablet 2 Pro’s built-in projector seemed to perform better than the standalone 3M Streaming Projector I have stowed away. The farther it was placed, the bigger the projection was, though the picture wasn’t very detailed. It’s good enough for showcasing a playlist of music videos during a themed party or projecting a Powerpoint presentation during an important business meeting, but not if you were thinking of hosting a backyard movie night. Lenovo also bundled in a few software tweaks to improve the image of the projection so that it doesn’t appear fuzzy or distorted. Since the projector itself is already so small, those tweaks hardly made a difference. How do you practice yoga in a tiny hotel room? By projecting the class on the wall. I personally used the Yoga Tablet 2 Pro to practice yoga in both a hotel room and at home in my cramped studio space. It worked better than a laptop or a smaller tablet because I could adjust the kickstand to place the projector at eye level from a table higher up while I practiced yoga on the floor. This made it easier to follow along with online yoga classes, and the Yoga Tablet 2 Pro’s stereo speakers were loud and clear enough for me to hear directions over my Spotify playlist blasting from another device. My yoga pals thought it was cool, too. Bear in mind that if the battery is running low the projector won’t turn on, even when it’s plugged in and charging. Also, the projector part of the chassis gets a little hot during use, though certainly not as hot as a full-size projector. Lenovo says the Yoga Tablet 2 Pro lasts up to 15 hours on its 9,600mAh battery pack, but that depends on your use. It took about two days of varying usage—including a bulk of time where it was on standby—before the tablet needed a charge, and when I finally plugged it in, it took a really long time to fully charge. We’ll update this review with battery rundown lab tests. Inside, the tablet is powered by a 1.86GHz quad-core Intel Atom Z3745 processor with 2GB of RAM, which should be enough for a device of this caliber. However, performance was not up to par with what I’m used to with a fresh-out-of-the-box smartphone or tablet. Not only did it take me a week of constant use to get a hang of Lenovo’s custom Android overlay, but the software froze from time to time. There were several instances I had to turn the screen on and off to sort of refresh it because it wouldn’t recognize any input. There’s a 8-megapixel rear-facing camera and 1.6-megapixel front-facing camera for video chats and quick snaps. The Yoga Tablet 2 Pro also comes with 32GB of storage space, though only 24GB is immediately available to you. You’ll have to pop in a MicroSD card on the back to make more space. It’s not an iPad, so why does it look like one? 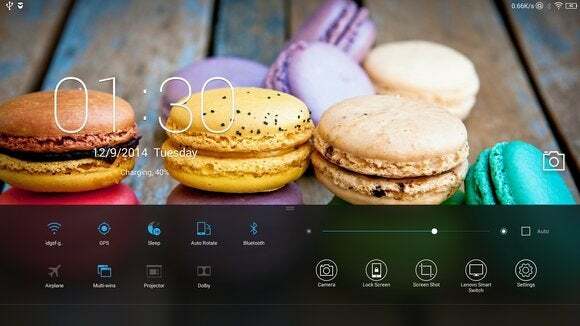 If there were Razzie Awards for Android forks, launchers, and overlays, Lenovo’s Android interface would come out on top as one of the worst renditions of Android ever. This Home screen is so static and iPad-y. Lenovo’s Android interface is one of the most complicated versions of Android I’ve ever used. Nevermind that it’s built on top of Android 4.4.2 KitKat—Lenovo styled the Yoga Tablet 2 Pro’s interface to mirror the iPad’s, right down to the annoying folders and apps you can’t remove from the Home screen. WTF? It asks me to place a new app in the appropriate folder. What if I just wanted to hide it away in the Application Drawer? The rest of the interface is unintuitive. For instance, the Quick Settings shade is at the bottom of the screen, so you’ll have to slide up rather than down from the top. Then there’s a separate notifications shade with an embedded Settings button that takes you specifically to the settings panel for the notifications shade rather than the general list of settings. It’s mind boggling. Lenovo’s Quick Settings reside at the bottom. Okay. While there are a few helpful features sprinkled throughout—like a multitasking mode and some options to turn off some of the more annoying aspects of the interface—it’s a real pain to use right out of the box. The Yoga Tablet 2 Pro may be a slick piece of hardware, but the interface alone will make you run for cover. Would you use this tablet/projector hybrid? A big tablet with a very useful piece of hardware. If the answer to the above is “yes,” then I think I’ve found your tablet. Granted you’ll have to spend some time installing another launcher to get the awful taste of its interface out of your mouth, but overall the Yoga Tablet 2 Pro is a solid device. I didn’t mind it’s size after a while, either. I was much more productive with Android on a larger screen, and though it was a bit awkward to wield on transit and on the plane, once I got into a groove I managed to feel really productive. Lenovo knows what professionals want because it’s been in the business of catering to that particular clientele for years. 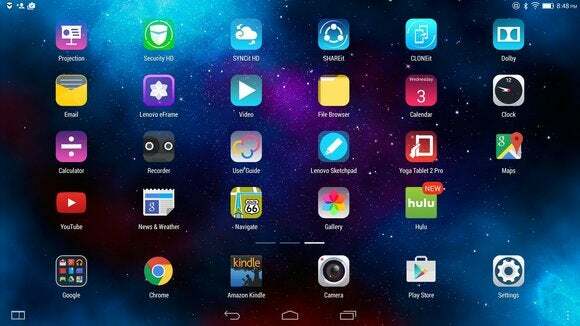 As it figures out its Android strategy here in the U.S., I hope the awful launcher and crapware doesn’t continue to seep into its Android product lineup. Motorola can teach the company a thing or two about how to make an innovative device without suffocating stock Android with obnoxious overlays and confusing features. A fantastic, productivity-focused tablet that's marred by Lenovo's subpar Android interface.